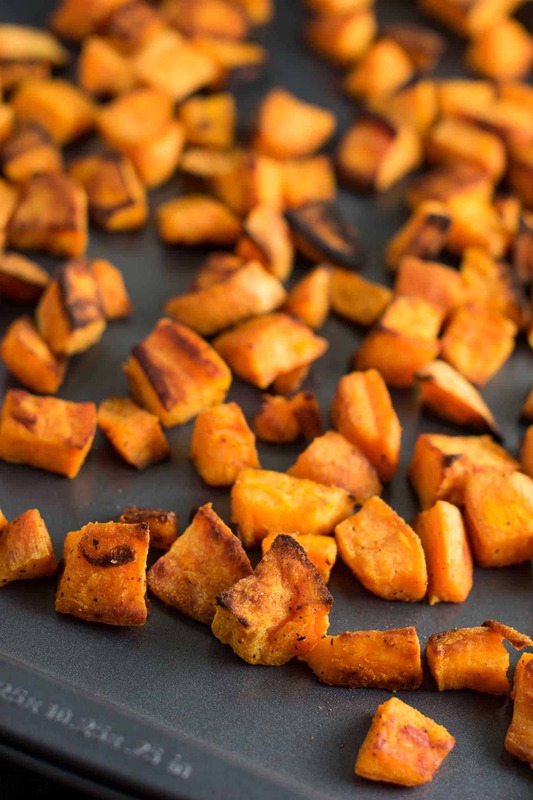 These easy roasted sweet potatoes are my go to sweet potato recipe. They are the perfect side dish for any meal! Sweet potatoes are one of my favorite vegetables, and I usually buy a few every week when I’m at the grocery store. It didn’t always used to be this way though. Many foods that I grew up disliking, I learned to love once I started to experiment with cooking myself. No more plain whole roasted sweet potatoes for me! Until I started cooking, I’m pretty sure the only time I ate sweet potatoes was at Thanksgiving. Now I eat them all the time! My favorite way to make sweet potatoes is roasting them until they get a little crispiness on the sides. From sweet potato nachos to sweet potato tacos and healthy chocolate milkshakes, sweet potatoes are so versatile and so delicious! First, preheat oven to 450 degrees. High heat will help us get those crispy edges on the sweet potatoes! Peel your sweet potatoes and dice them into small cubes with a knife. 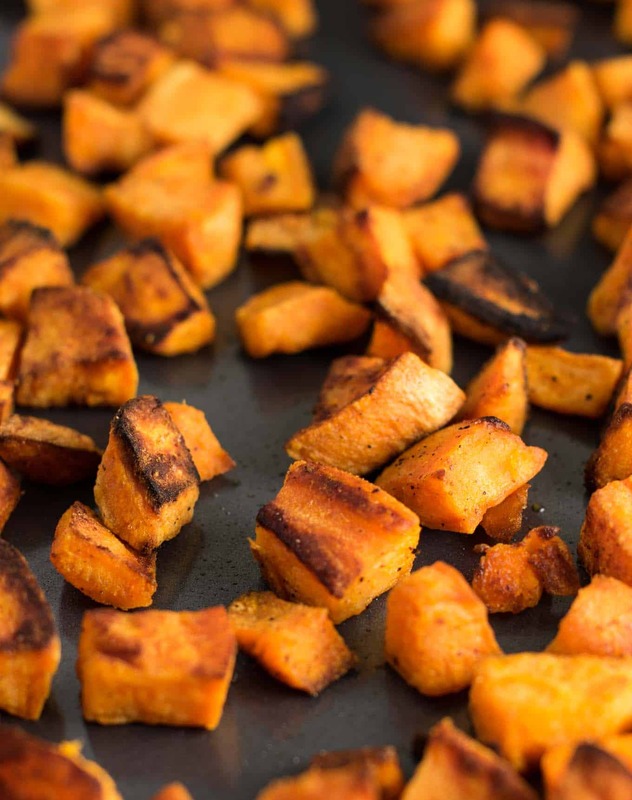 Toss the sweet potato cubes with olive oil, salt, pepper, and garlic powder until coated on all sides. 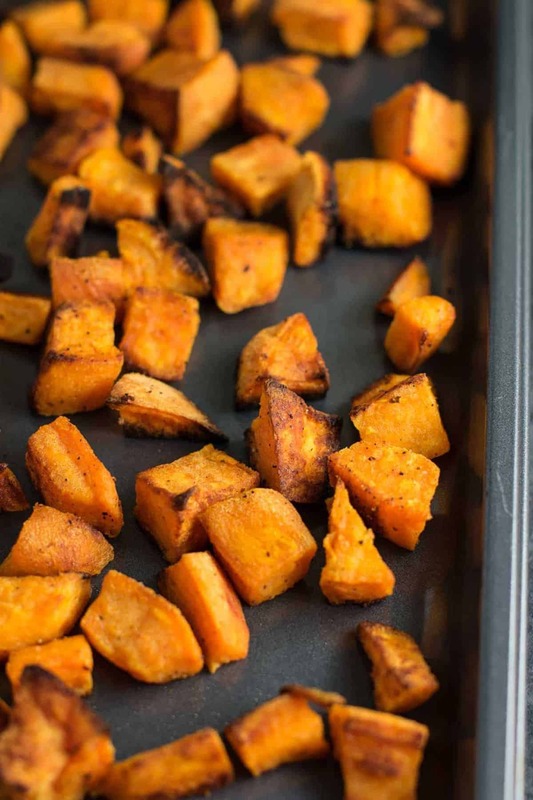 Spread out sweet potatoes in an even layer on a baking sheet and put them in the oven! 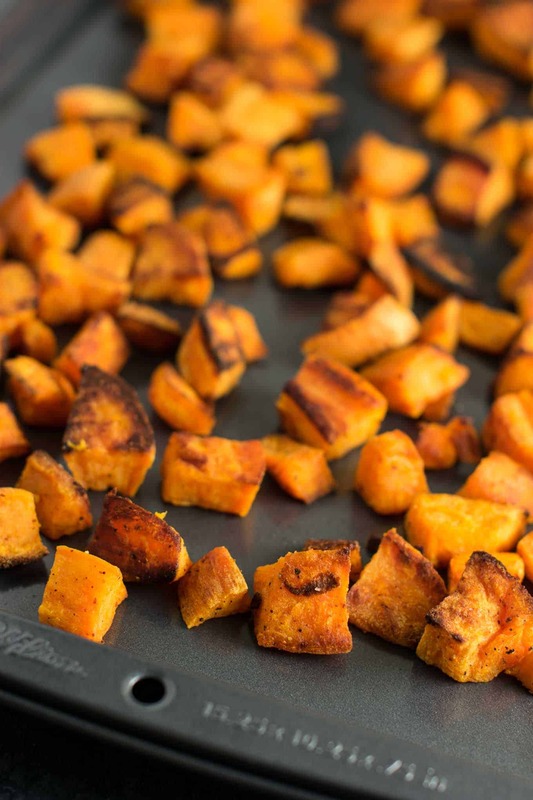 Roast sweet potato cubes until crispy, flipping every 10 minutes to avoid burning. 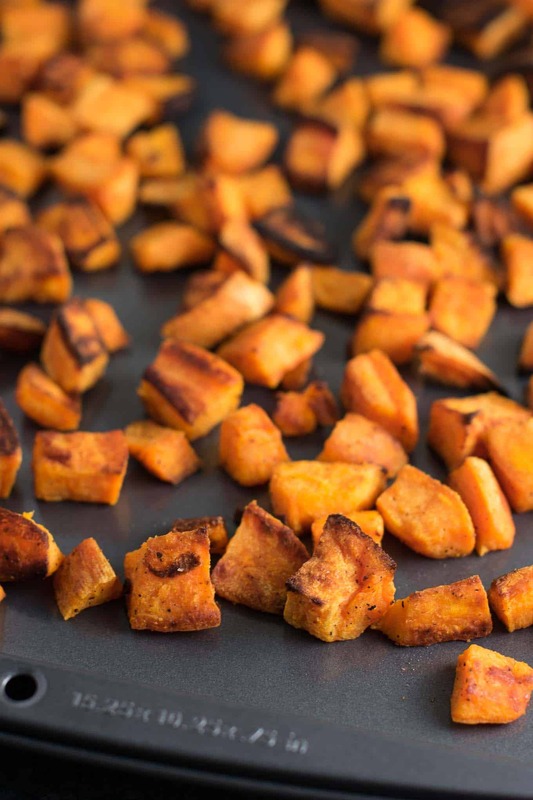 These baked sweet potato cubes are my go to recipe. Anytime that I buy sweet potatoes, 90% of the time it is to make this recipe! The spices are a starting point that are mild enough for any recipe. If I’m making mexican, I will add in some chili powder or cumin. For breakfast recipes, I might add in some onion powder or thyme. What I love the most about roasting them this way is the versatility: I can eat them for breakfast (with eggs), for a side dish, on nachos (my favorite!) or serve them with pasta. There isn’t a meal of the day that I wouldn’t eat sweet potatoes! This recipe uses 2 large sweet potatoes. My husband and I ate almost the whole sheet pan ourselves, and my son had a little leftover for his lunch the next day. If you have a little one that is starting to grab his own food, these are a great veggie to feed him or her! Crosby loves anything he can grab himself and doesn’t let us feed him much of anything anymore, so these sweet potatoes are perfect for his little hands. If you need an easy side dish or just want to add some more veggies in your diet, these are a great choice. Ready in less than 30 minutes and no fancy ingredients required. Looking for more ways to eat sweet potatoes? Here are some of our favorites! Did you make this recipe? I want to see! Don’t forget to tag me on instagram @buildyourbite and hashtag #buildyourbite with your recipe photos! These easy roasted sweet potatoes are made with just 5 ingredients and ready in less than 30 minutes. Versatile enough to eat for any meal of the day! Did you make this recipe? Be sure to leave me a star rating below! Hi Joy, My maiden name is Shull. Is your husband by any chance related to the line of Shulls from Broadwater, Nebraska? Just curious! I never see the Shull name. Looking forward to trying your sweet potatoes tonight!! He is not, but it’s fun to hear of more Shulls! I agree it is an uncommon name. I hope you enjoy the sweet potatoes! Funny enough my husband has a sister named Amy, so her maiden name was Amy Shull! We make these all the time, love the recipe!